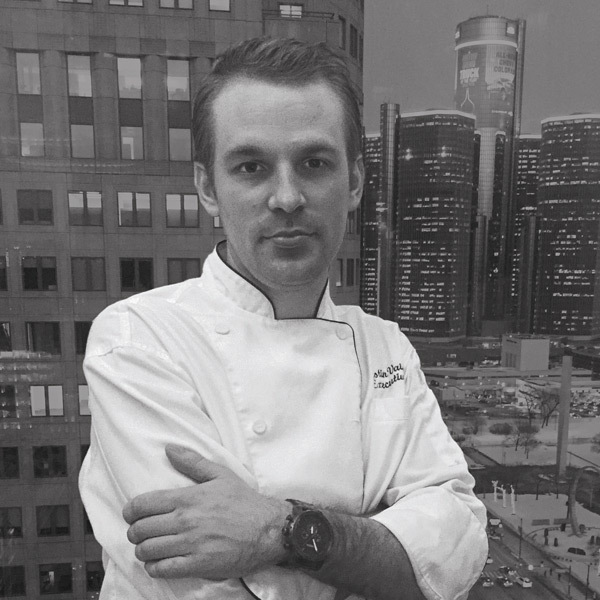 Vaiciunas graduated from Schoolcraft College’s Culinary Arts Program, and immediately began his first fine dining job as a lead cook at the acclaimed Detroit Athletic Club. Within a year, he was working at 220 Merrill and Forte in Birmingham. Always looking for that next opportunity, he landed the chef de cuisine position at The Hill in Grosse Pointe. After accepting the position of executive chef at Zin Wine Bar in downtown Plymouth, Vaiciunas began to experiment with liquid nitrogen, sulfurifications, and foams to create artistically plated dishes, always utilizing the freshest ingredients. After leaving Zin Wine Bar, he moved to Salt Lake City, not only for the skiing, but also to experience the culinary scene in a different part of the country. He became executive sous chef at The Aerie, a fine dining restaurant at Snowbird Ski and Summer Resort. Vaiciunas returned home after he was offered the job as executive chef and director of food and beverage for the newly renovated Crowne Plaza Pontchartrain Hotel in Detroit. Since accepting the position, he has been responsible for setting up Crowne Plaza’s banquet facilities, along with opening two of their restaurants and bar, including The Jefferson House and Urban Cellars Bar, along with the newly designed historical Top of the Pontch, a fine dining restaurant on the 25th floor of the hotel. With the success of The Top of the Pontch, he now focuses his time exclusively as the executive chef, continuing to bring a bold new style of dining to the Detroit area.